With my first baby, I had my hospital bag ready at 34 weeks, just in case my daughter made a super early appearance. By the time my third daughter was on her way, I was packing for the hospital in between contractions, about two hours before she was born. It’s true, there’s a huge difference in your first and subsequent pregnancies! Fresh 48 photo sessions are such a beautiful way to capture those first few hours with your baby while you’re still in the hospital. Yes, you’ll be tired. But there is nothing like cuddling your newborn and oh, that incredible new baby scent. You’ll probably be overjoyed to finally not be pregnant anymore (that really is a fabulous feeling!). These sessions are a great option to make happy memories of your newly expanded family, especially if you’re not interested in hiring a birth photographer to capture the whole labor and delivery. The first question on every mama’s mind is about what to wear for a Fresh 48 hospital session. 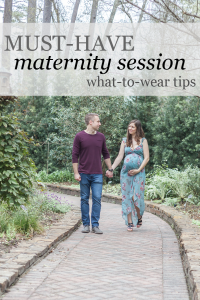 I’ve got you covered with photos and details about why these mamas look great – and even how to ensure your husband looks awesome, too! This first-time mama changed into a lovely nightgown right after I arrived and I fell in love with how feminine and beautiful it was. She definitely does not look like she just had a baby less than 48 hours ago! Why this look works: The gentle floral pattern brings out Alexis’ girly side without distracting from her beautiful baby boy, Leo. Alexis had just had a c-section a day before her session, so she was still sore and tender. The loose fit of her gown meant she didn’t have to worry with itchy or uncomfortable material near her incision. Her natural curly hair and lipgloss pulled the whole “brand new mama” look together. It was also easy for her to nurse in her gown, which is definitely a bonus for new mamas. The weather was still pretty warm in Houston the day of her session, so she didn’t need sleeves, but a simple black cardigan would have worked so perfectly! What to wear for hubby: If you’re considering a classy gown like this for your Fresh 48 photo session, make sure your husband looks great, too! Steffan earned my vote for Best Dressed New Dad 2018 in his chambray button down and khakis. He kept the shirt untucked for a more casual look that perfectly complimented Alexis. Although I shot this Fresh 48 session in Tomball, TX in 2016, it’s still one of my favorites of all time. Hailey and her husband were overjoyed to welcome Aurora, a miracle rainbow baby born after they had lost a daughter previously. While I try to capture the joy of being new parents in every Fresh 48 session, this one deserved even more care and attention to detail. You can see Hailey is captivated by her daughter – she could barely look away from her to smile at the camera. Hailey requested to stay in the hospital bed for her Fresh 48 photos, which is common for mamas who have had c-sections. There are still endless ways to capture new motherhood, even if you never leave your hospital bed! Why her look works: Hailey was gorgeous in a simple black lace nursing top. The snaps made it simple to feed baby and the lace adds a feminine touch. Black is also a fantastic choice because it looks great against delicate newborn skin. We kept the blanket pulled up to the bottom of her bra. What to wear for hubby: A simple solid color polo shirt and jeans will work perfectly. Avoid logos and busy patterns. Amya was overjoyed to finally meet her son, Oliver. Her sweet rose pink gown looked great with her own creamy skin and dark hair. I’m always a fan of pink for new mamas! The majority of women I’ve photographed after having a baby don’t bother with much, if any, makeup. Let’s just say you have other things on your mind! The “new mama” glow is so gorgeous that makeup isn’t necessary, unless you’ll feel more comfortable with it. Of course, if you’re pregnant for the first time, you don’t know how you’ll feel after having a baby. That’s why I advise mamas to pack something that makes them feel beautiful for this photo session. That way, you’ll feel fabulous even if you don’t want to make time for your full makeup routine. Why this look works: Amya is cute and comfortable in a sweet gown that makes nursing simple and keeps her comfortable while cuddling with Oliver. She packed a nursing bra for a little added support and it worked well with the black accents on her gown. What to wear for hubby: New dads will look great in a neutral colored shirt and jeans or shorts. Small logos like this one on dad’s shirt are fine, but avoid anything bigger that distracts from you and baby. This mama had just delivered 14 pounds of babies! Her boy-girl twins are seriously so adorable! Not only did Bethany and her husband Lee welcome twins Arabella and Cade, but they also have two little boys at home, too! She went from two kids to FOUR overnight! I think we can all agree that Bethany is Superwoman! Her relaxed Fresh 48 session in The Woodlands, TX was amazing, and not just because there were two babies instead of just one. Bethany and Lee are two of the calmest, most chill people I have ever met. They worked together so well during the photo session. While Bethany changed clothes and put on some makeup, her husband dressed the twins and got them all ready for their first-ever photo session. I could tell they make a great team. Why this look works: This is real motherhood – a cute black shirt and black yoga pants! Bethany is comfy and kept her overall look natural just a day after having her twins. Her light makeup, lipgloss and pulled-back hairsyle highlight her natural beauty while she snuggles with her babies. If you’re one of those mamas who prefers pants over a gown, this is the option for you. The yoga pants provide a little support for your tired tummy muscles that supported a baby (or babies!) for nine long months. In fact, this was my personal favorite option for my own Fresh 48 sessions. What to wear for hubby: Lee kept it pretty casual too in a neutral shirt and basketball shorts. My best tip for dads: don’t wear pajama pants and you’ll be fine! Dress for comfort – after all, you just had a baby! A neutral, earth-toned top will compliment you and baby. Think brown, cream, ivory, gray, black or even navy. Nursing tops or camis and button-downs work really well. I have a selection of gorgeous floral wraps for my mamas to use – just pair them with your own cami and you’re photo ready! Avoid bright and neon colored shirts, as well as big prints, patterns and logos. These are very distracting and take away from you and your baby. I plan for mamas to stay in the hospital bed during Fresh48 sessions, so pajama pants or yoga pants will work! Select a solid dark color, like black or navy, just in case you decide to get out of bed. Avoid pajama prints with crazy, loud patterns. How you do your hair and makeup is up to you. Some mamas have a friend or family member help with a simple hair style and makeup, while others opt for a natural look. Throw some dry shampoo in your hospital bag in case you haven’t had a shower before your photos. You probably won’t be too concerned with accessories, but keep them simple if you pack any. We can get some sweet shots of baby with your wedding rings, which is one of my favorite photos! I can help style you when I arrive, and we work at a relaxed pace. Bring a couple tops if you aren’t sure what to wear – you’ll always have the option to change clothes if you want to add some versatility to your photo session! These tips are just a tiny sample of what’s included in my Celebrate Motherhood Style Magazine! It’s full of photos, suggestions, details, tips and tricks for a beautiful hospital session – including a FULL list of what to pack in your hospital bag from a mama who’s delivered three babies! Once you book your session, you’ll receive the Celebrate Motherhood Style Magazine via email. It will make preparing for your session the easiest part of pregnancy – I promise! I design luxury maternity, fresh 48, at-home newborn and breastfeeding mini sessions to help you celebrate the beauty of motherhood. I’m based in Houston, TX – and I am always happy to travel to you! If you’re thinking about a Fresh 48 photo session, contact me to get your FREE Welcome Guide. It’s got all the details about photo sessions and how to plan for beautiful photos you’ll love forever. Click the button below to get your copy!